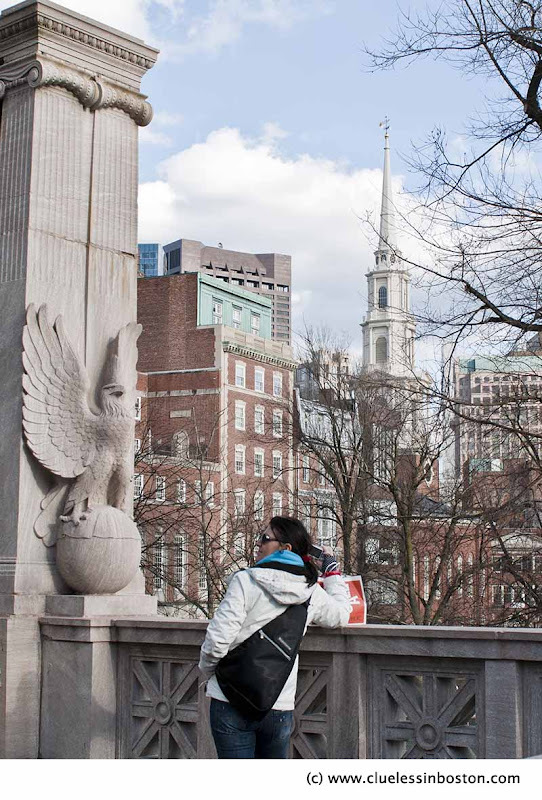 In response to a question, the location of this shot is next to the Robert Gould Shaw Memorial on Beacon Street, across from the State House. My first thought is the Park STreet church...Could you give the location of where the young lady is standing? Nice photo. She looks like she is lost in Boston. Just kidding. Nice picture. Yay! Bigger photos - oh, well done. They look terrific. I really like this one - the pretty young lady against the backdrop of all those stacked-up blocks... and the eagle about to pounce! This is really good. Lots going on in the photo, well composed. I love the architecture behind!